TADkit creates interactive 3D representations of chromatin conformations modeled from 3C-based interaction matrices. The user can overlay 1D and 2D tracks of data to these 3D views to evaluate the relationship between the 3D structure of the genome and its biological function. Click on the screenshot to showcase its parts and functionalities in our server. TADkit can be found in GitHub. 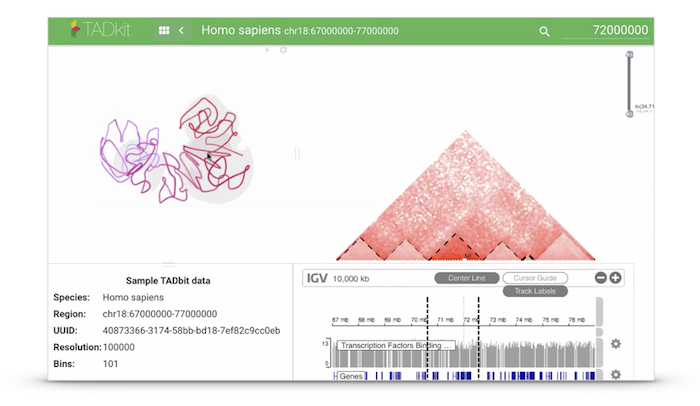 TADbit and TADkit are developed by the Structural Genomics Group @ CNAG-CRG in Barcelona.